Square Clear Beverage Dispensers - Cal-Mil Plastic Products Inc.
Showcase your beverages with this elegant and stylish beverage dispenser. 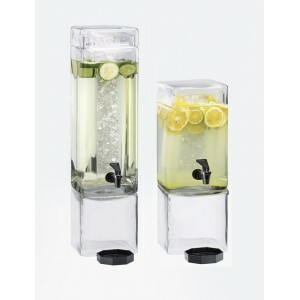 Made from crystal clear glass or acrylic, this dispenser elegantly displays colorful juices, water, iced tea, and any other beverage of your choice. Features a removable ice chamber to keep your beverages cold and fresh or and infusion chamber to create drinks to your liking.